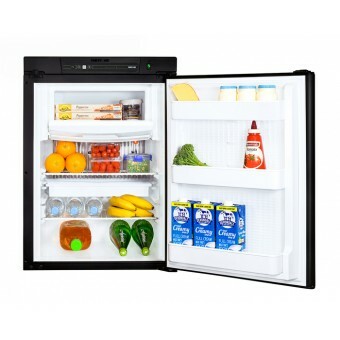 Thetford N314E, 3 Way Absorption Fridge 91L, 3 year warranty. Thetford N3175E, 3 Way Absorption Fridge 171L, SES Left Hand Hinge, 3 year warranty. Absorption 3 Way Fridge Freezers are very popular for Caravans/Motorhomes as they are silent, avoid the use of moving parts, highly resistant to wear and tear, and are easy to maintain. 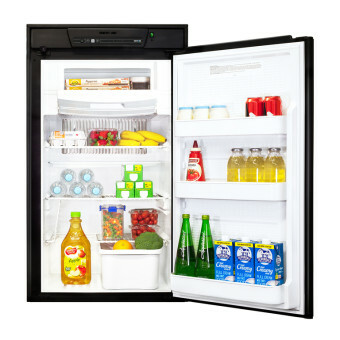 A 3 way caravan fridge enables you to choose between the power source of 12/24Volt, 240Volt, or LP gas. 3 way fridge freezers use a gas flow heat exchange system (absorption) in the back of the fridge. Dometic pioneered the absorption technology in 1922 and today, the Dometic 3 way fridge are considered the best in class 3 way caravan fridge models. A 3 way caravan fridge is especially popular for its efficiency; a 4 kilogram LPG gas bottle can run a 3 way fridge freezer for around 10 days. Similarly, a 3 way fridge freezer is also very efficient running on 12 volts power source, only drawing around 10amps. Also making 3 way caravan fridge models popular are their longevity – their simple design means they keep on keeping on. Especially when you opt for a quality brand such as a Dometic 3 Way Fridge, which are backed by national service agent network, you know you are always covered for spare parts and product support. 3 way fridge freezer units need to be installed and certified by a qualified and licensed gas-fitter.